Glad to know that the Ateneo-DigitalFilipino.com Certified Blog Entrepreneur Program is a go where Module 1: Blog Launch, Copywriting, and Basic Promotion will take place this October 16 to 30. 1. 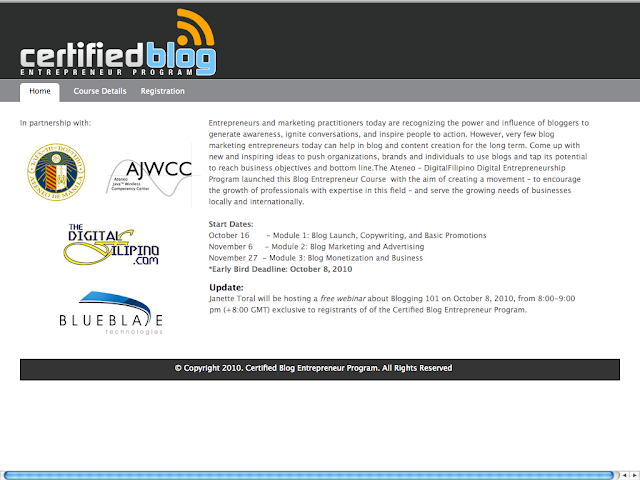 Paid participants for the Ateneo-DigitalFilipino.com Certified Blog Entrepreneur Program. 3. Blogging from Home book owners. To prove book ownership, just post a photo in your blog holding a copy of the book or upload your photo at Yahoo! Meme. Don't forget to post the link to the comment section here.